If you’ve spent any time with me, one thing you’re quick to learn is I’ve a deep love for food. Looooove it! From cooking to eating, watching shows to reading articles, I’m a foodie at heart. Whenever my mom, sister & I get together, most of our time revolves around either cooking or devouring delicious cuisine. For my birthday this year, my sweet mom gave me an awesome gift: a year’s subscription to Food Network Magazine. What a fabulous publication! Each month is chock-full of delicious recipes, creative kitchen ideas & fascinating food facts. Now the first week of every month finds me giddy and eagerly checking the mail for its arrival. One of my favorite features is the photo recipe index at the front of each issue. It shows pictures of all the recipes featured that month. After all, you eat with your eyes first. Brilliant! January’s issue does not disappoint! I tried my first January recipe last night: mac & cheese soup. The name intrigued from the get-go. Our family devours mac & cheese, but the butter and excessive flour always leaves me feeling guilty afterwards and hesitant to make it again. But each time, the call to cheesy goodness prevails. As I read the words, “cut the calories in half”, I knew I had to give this recipe a try. Oh my word. This soup is SCRUMPTIOUS! 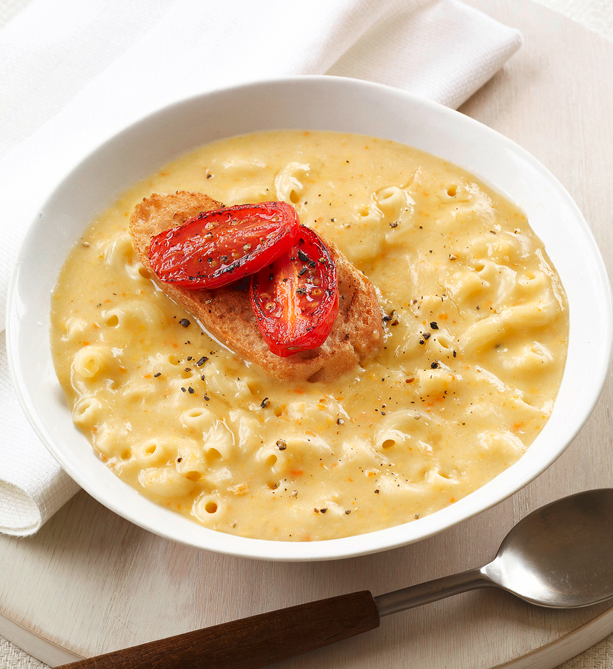 It completely satisfies in the cheesy department with full-bodied flavor coming from the aromatics and chicken broth. Did I mention there’s a full serving of carrots & celery in every pot? My hesitant husband (“it won’t taste like watered-down mac & cheese, will it?”) devoured three bowls! The soup itself has no – I repeat NO – salt in it. This soup is comforting, filling, jam-packed with flavor and whips up in only 20 minutes! We Leinos will certainly be enjoying this recipe again and again. So for all the cheese lovers out there, you’ve got to try this!